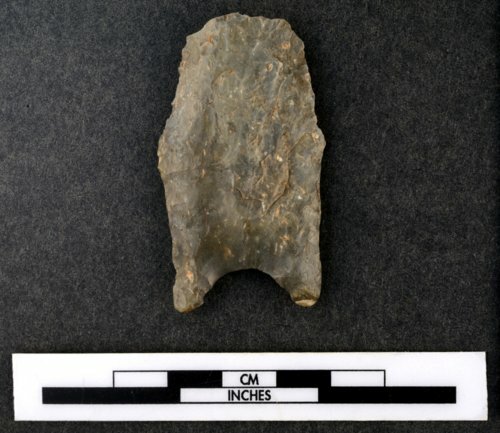 This Late Paleoindian point is called a Dalton and functioned as a spear tip. It was found along the Blue River in Kansas and donated to the Kansas Historical Society in 1925. Late Paleoindian people traveled in small groups, hunting large game, including now extinct bison. Stone tools help reveal how these people lived, traveled, and differed from other groups. Late Paleoindian points are typically long, thin, and narrow, and carefully made. Points with minor damage were often resharpened, altering their original shape.